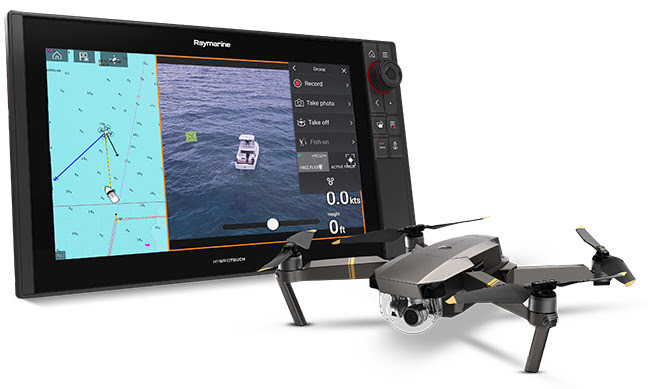 Coming this summer, Raymarine’s new Axiom UAV app integrates advanced marine electronics with Unmanned Aerial Vehicle (UAV) technology. Our powerful Axiom multifunction displays integrate seamlessly with the advanced DJI Mavic Pro drone to give anglers a bird’s-eye view of fish, bait, reefs, weed lines and much, much more! Compatible with the popular and highly capable DJI Mavic drone, the Axiom UAV app automates many common tasks including launch, airborne imaging, in-flight navigation, and return-to-boat. Fishing and cruising boats alike can now experience cutting edge aerial imaging integrated right into their Raymarine Axiom multifunction navigation display. FLIR Systems, Inc. is a world leader in the design, manufacture, and marketing of sensor systems that enhance perception and awareness. FLIR’s advanced systems and components are used for a wide variety of thermal imaging, situational awareness, and security applications, including airborne and ground-based surveillance, condition monitoring, navigation, recreation, research and development, manufacturing process control, search and rescue, drug interdiction, transportation safety, border and maritime patrol, environmental monitoring, and chemical, biological, radiological, nuclear, and explosives (CBRNE) threat detection. For more information, visit FLIR’s web site at www.FLIR.com. Raymarine, a world leader in marine electronics, develops and manufactures the most comprehensive range of electronic equipment for the recreational boating and light commercial marine markets. Designed for high performance and ease of use, the award-winning products are available through a global network of dealers and distributors. The Raymarine product lines include radar, autopilots, GPS, instruments, fishfinders, communications, and integrated systems. Raymarine is a division of FLIR Systems, a world leader in thermal imaging. For more information about Raymarine please go to www.raymarine.com.